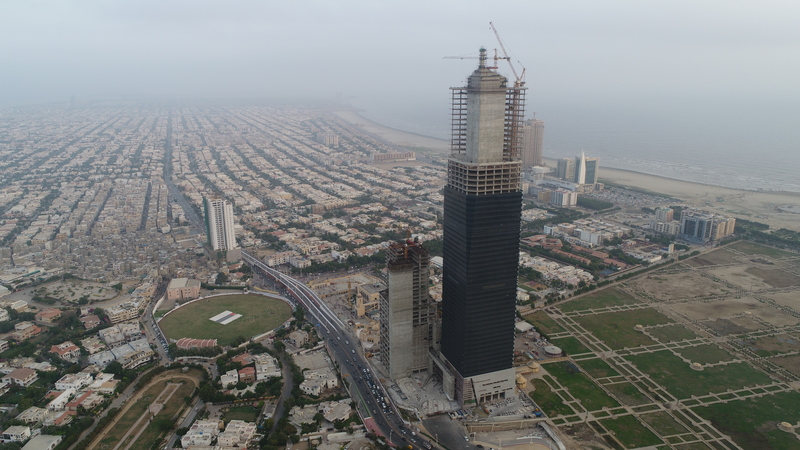 KARACHI: Karachi Bahria Town celebrated the completion of construction of Pakistan’s tallest building ‘Bahria Town Icon’, located on main Shahrah-e-Firdousi, in a graceful ceremony. The high point of the ceremony was the installation of a mast on the 62nd floor of the skyscraper which marked the official completion of the structure work. The works on the building’s interior are already in progress with the shopping mall opening early next year, and the offices ready for possession. With its completion, Pakistan officially enters the 300m (and above) Buildings Club of South Asia. According to details, the Icon tower comprises of two buildings, one of which is 62-storey office and apartment tower. Apart from this, there are restaurants, retails areas, 16 high-speed lifts which are the fastest in the world, and a vast parking space. The second building is a 42-storey apartment tower. Equipped with all the modern facilities, the office floors in the towers are ready for possession. One of the most important features of the skyscraper is its 7-levels of basement parking space which is not only the first in Pakistan but also the first in entire South Asia and the Middle East. Another unique feature is a sky-view deck located on the rooftop of the tower for a mesmerising view of both the Arabian Sea and the metropolis. There are double-decker lifts, fully air-conditioned interiors, outstanding building management system, life and fire system, cineplex, shopping mall, food court and numerous other amenities.